I planned my regular Tuesday post on Pre-temperance forebearer, Carrie A. Nation, who later changed her name to Carry A. Nation after her divorce from her second husband. But Rob beat my to it by several years. So Tuesday’s post will even be a surprise for me. Enjoy! Don’t know what that means? Well, to sum it up succinctly, she hated alcohol, and people who drank it. After her first husband died of alcoholism in 1869, Nation began a journey which would lead to her becoming the most famous member of the pre-Prohibition temperance movement. Nation with hatchet, Bible, and fashionable spectacles. What a spectacular photograph! 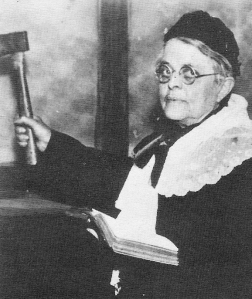 And all this time I thought Carrie Nation was a description of a country that watched too many Stephen King adaptations. the perfect name and the perfect pic. Wooo Carrie Nation! She was a hell of a lady. She was way ahead of her time. In her case, instead of 3 strikes, you’re out. She was 30 strikes. That’s got to be a record.